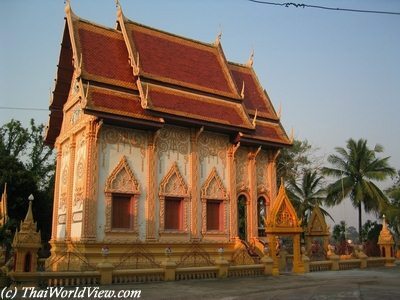 A Thai Buddhist temple ("WAT" - วัด) is a complex comprising several distinct religious buildings. Major Buddhist ceremonies happen in temples. Some ceremonies (wedding, death, building consecration) are done by monks outside the temple. In Thailand, around 30 000 Buddhist temples are consecrated. Thai Temples have architectural differences in all Thailand areas. 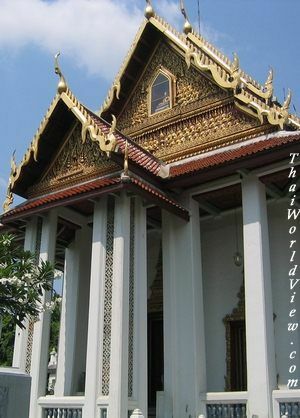 For example, in Thailand northern area, some temples are built with a Burmese influence, i.e. some Buddha statues are painted in white and monasteries are often made of teak (Lampang and Mae Hong Son cities). 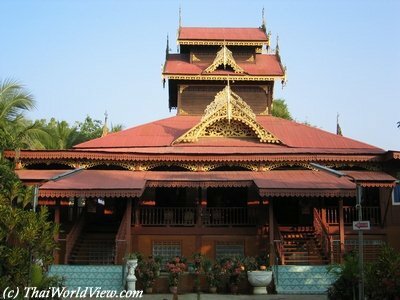 In Northeastern area, Thai temples are built with a Laotian influence. Thai temples are safe places for poor people. There they are sure to get a place to sleep and a meal also. Every visitor is welcomed to sleep one night at a temple. But if the stay is longer than three days, visitors are expected to act like monks and shave their head. 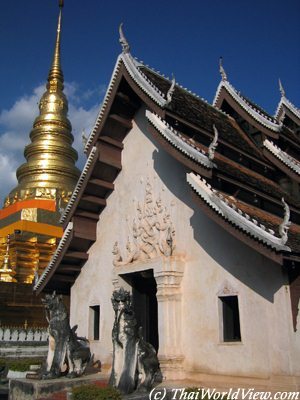 A Thai temple is composed of several buildings, which are described in the following pages.